There are ten species of jays in North America. These birds can be found in the conifer forests of Canada, drier regions of central United States and the tropics of Mexico. Jays are loud birds who are known for their noisemaking whenever their area is intruded upon. 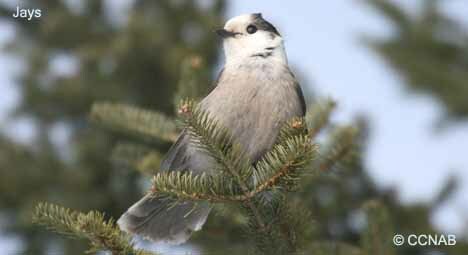 The Canada Jay was known as the Gray Jay and is the most northern jay. The Blue Jay and Steller's Jay can also be found in the northern regions of Canada. There are 3 separate groups of Scrub-Jays, the Florida Scrub-Jay as the name indicates is found in central Florida, the Western Scrub-Jay is found along the western regions of the United States and the Island Scrub-Jay is found on Santa Cruz Island, which is among the Channel Islands off the coast of California. As well as the Pinyon Jay, which is found in the central parts of the United States. The Brown Jay, Green Jay and Mexican Jay are tropical birds and are the most southern jays in North America.